Now you may be saying to yourself, “Another article telling me to eat vegetables.” :sigh: However, this is not just another one of “those” articles. There are more reasons to eat your veggies than you may think. 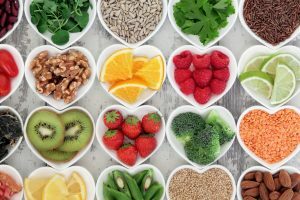 Besides providing digestive-friendly fiber and antioxidants, a recent study has shown that eating a more plant-based diet can actually lower your heart and diabetes health numbers. Your numbers are the markers that you and your healthcare provider can use to track your health progress. These numbers include cholesterol, blood pressure, and blood glucose levels, to name a few. It is important that you have these numbers checked at least yearly. If you already have diabetes or another chronic disease, have labs checked more often as recommended by your doctor. Why are vegetables so important? Vegetables are important for many reasons. Fiber: Vegetables and other plant-based foods contain the complex carbohydrate known as fiber. The gut does not digest fiber. Because of this it doesn’t count towards your total carbohydrate intake, hence net carbs. Net carbs are grams of total carbohydrate from grams of fiber from the nutrition label. In addition, fiber can help you stay fuller longer. This can aid weight loss efforts if eaten at meals and snacks. Finally, fiber is great for gut health. This is because it helps bulk stool and slows digestion to help the body absorb more nutrients from food consumed. Increased fiber intake can help lower cholesterol numbers and keep blood glucose levels more stable. Antioxidants: When people tell you to color your plate, antioxidants are the reasons why. Antioxidants are compounds that help reduce cell damage in the body. In turn, they help lower your risk of chronic disease. Every color of the rainbow in plant-based foods represents a different set of antioxidants. Each set of antioxidants provide different health benefits. Research has linked diabetes with oxidative stress-related cell damage. Therefore, eating a lot of them can help prevent or improve diabetes health outcomes. 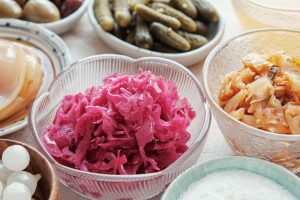 Prebiotic quality: Probiotics, or “good” bacteria, are becoming all the rage these days and for good reason. Research shows that a good balance of bacteria in the gut may help reduce oxidative stress-related cell damage. 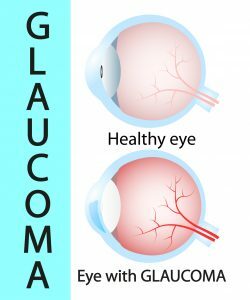 In turn, this may help lower risk of chronic diseases linked to inflammation such as heart disease, diabetes, certain skin conditions, and digestive conditions, to name a few. Probiotics are living organisms like bacteria or fungi that can benefit health. They can be found in supplement form or in fermented foods like yogurt, kefir, kimchi, or sauerkraut. On the other hand, prebiotics are those foods that help feed probiotics. Just like when you are hungry, probiotics may not work as productively if they are not fed. Therefore, plant-based foods such as artichokes, asparagus, and bananas should be eaten everyday. This study suggests that a plant-based diet pattern may help improve the health of those with diabetes. More studies will need to be done to confirm specific long-term health benefits for diabetes management. However, in the meantime, add in more plant-based foods to your diet like fruits, vegetables, nuts, and seeds for other benefits. In addition to eating more plant-based foods, you can try diabetes supplements as well to help control your blood glucose levels. Glucarex by Vita Sciences contains ingredients like chromium, alpha lipoic acid, and cinnamon that can support weight loss and healthy blood glucose levels. McMacken, M. and Shah, S. (May 2017) “A plant-based diet for the prevention and treatment of type 2 diabetes.” Journal of Geriatric Cardiology, 14(5): 342-354.